10 Spring Flea Markets in the US You Shouldn’t Miss 5 out of 5 based on 7 ratings. 7 user reviews. The heralding of spring brings flowers in bloom and longer sunshine-lit days. For those who love antiques and collectibles, spring also brings about another great thing: flea markets. Some of the best flea markets in the US feature limited runs and attract thousands of visitors each session, with attendees anxious to browse amazing collections from dealers across the country. Spring is a fabulous time to attend a flea market or antique show because dealers are anxious to share the new goods they collected over the winter and clean house. Whether you want to do redo your home, add to your collection, or just browse for something that catches your eye, flea markets and antique shows are just the place to shop. We made a list of 10 spring flea markets in the US. The venues selected contain great quality merchandise and half of the markets take place only a few times a year. As you make thrifting plans for spring, be sure you include a few of these on your list. When they do flea markets in Texas, they do it on a grand scale. Take the twice-annual Texas Antique Weekend. It doesn’t take place on a weekend, but is a week long. Antique Weekend is a collection of hundreds of show sites. More than 100,000 people shop at participating venues along rural areas between Houston and Austin. The activity is centered around Warrenton and Round Top, but also includes Shelby, Carmine, Fayetteville, Oldenburg, and Rutersville. While in Round Top, stop at the Marburger Farm Antique Show to browse over 350 dealers of vintage, antique, and collectible finds. 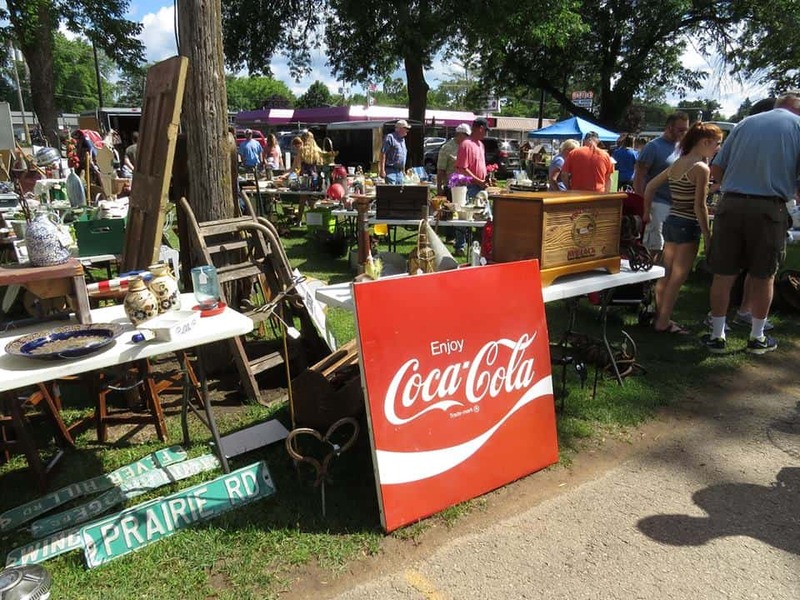 Antique Weekends features more than 60 antique, collector, and vintage shows and over 2,000 dealers. This giant marketplace has items ranging from the very cheap to high-dollar. Expect antiques (American and European), toys, industrial pieces, glass, pottery, jewelry, furniture, and so much more. 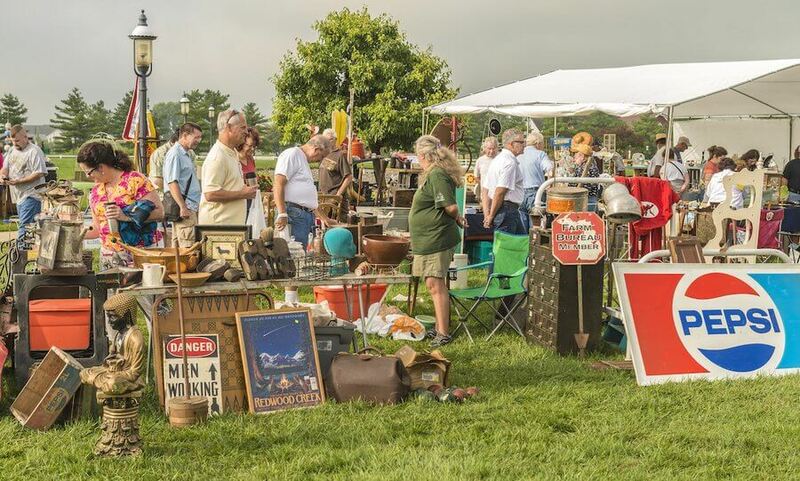 For one of the best spring flea markets in the US, head to Shipshewana, Indiana for the Midwest’s biggest flea market and auction. 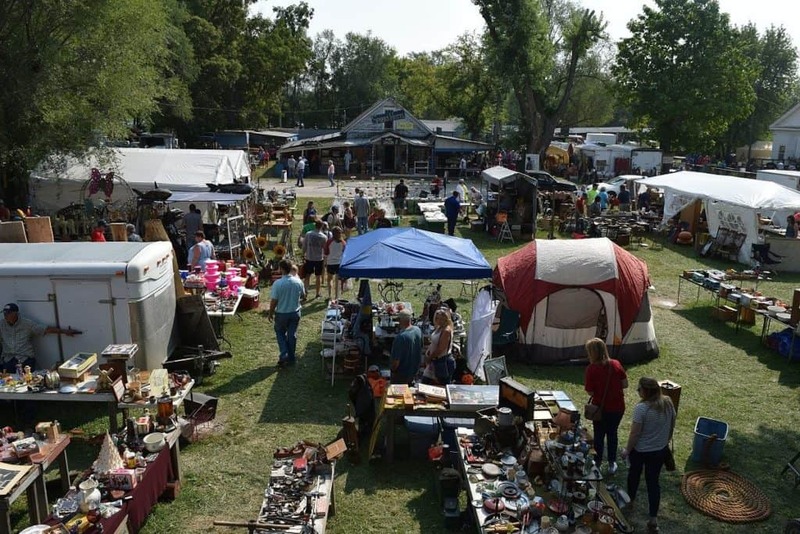 The market which began as a livestock auction in 1922, now has more than 900 booths and is considered by many antique enthusiasts as the best flea market in Indiana. Open twice weekly spring to fall, the flea market includes home decor, antiques, vintage pieces, handcrafted pieces, farm equipment, and other merchandise. The Shipshewana Miscellaneous & Antique Auction is held during the flea market on Wednesdays with 6 to 10 auctioneers selling off hundreds of antiques, vintage finds, and collectibles. Famished attendees can take a break from the auction and flea market by grabbing a home-style Amish meal at the on-site restaurant which serves lunch and breakfast. For getting your treasures back to your door with ease, Shipshewana features wagon and shopping cart rental. 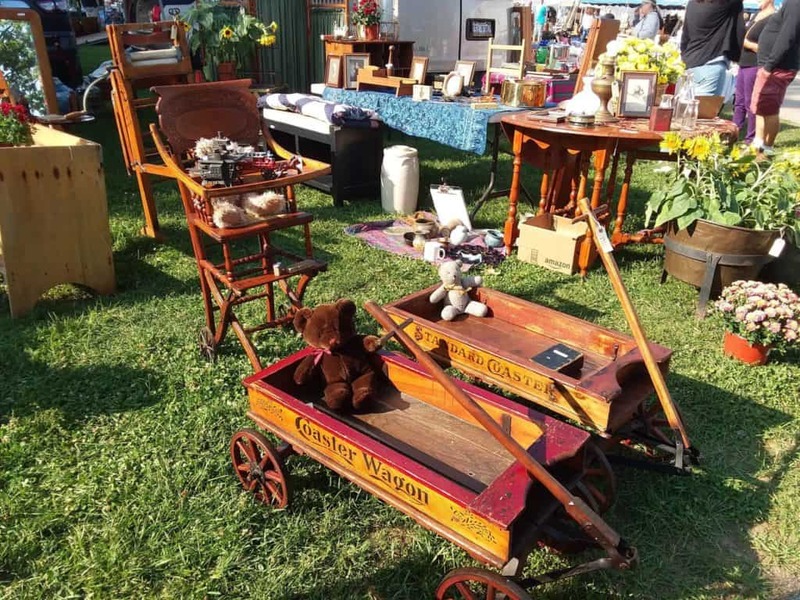 Springfield Antique Show and Flea Market is routinely named one of the best antique shows in Ohio and one of the Top 20 Flea Markets in the US, and only grows each year. For over 25 years, Springfield, Ohio has been the home of this monthly market. Held one weekend a month (except January, February, and July) at the Clark County Fairgrounds, Springfield features hundreds of vendors. Farmhouse antiques, Amish pieces, primitives, furniture, dishes, glass, samplers, quilts, and other collectibles are on hand for the browsing. Three times a year, Springfield holds their Extravaganzas and attract more than 2,000 vendors. Rose Bowl Stadium is one of most famous venues in the world. In addition to hosting sports events, it’s also host to one of the best spring flea markets in the US. 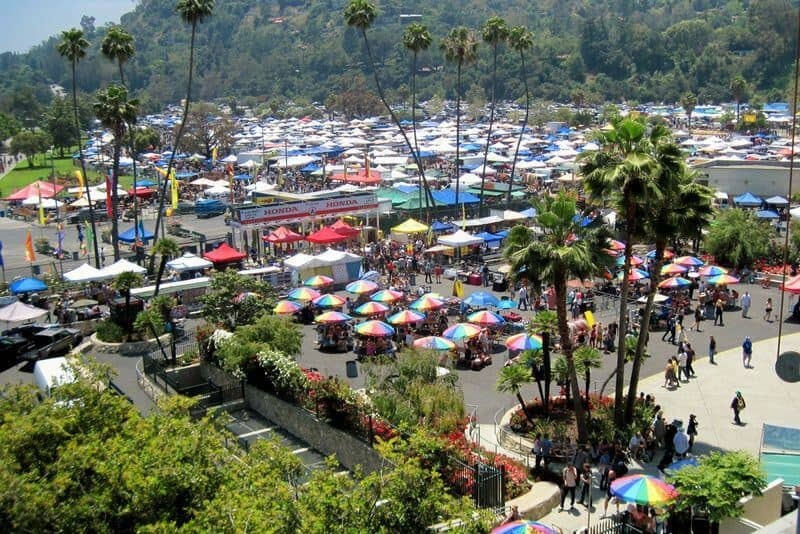 The Rose Bowl Flea Market is held the second Sunday of the month and attracts more than 20,000 attendees each session. Nearly 3,000 vendors are at this iconic flea market, a favorite among collectors and stars alike. There’s a full array of merchandise including vintage art, fabric, memorabilia, bicycles, clothing, jewelry, and antiques. Antique and vintage vendors are grouped together. The flea market also has food and beverages on-site to keep you refreshed for the jaunt. Admission is $9 per person, with VIP admission $20. 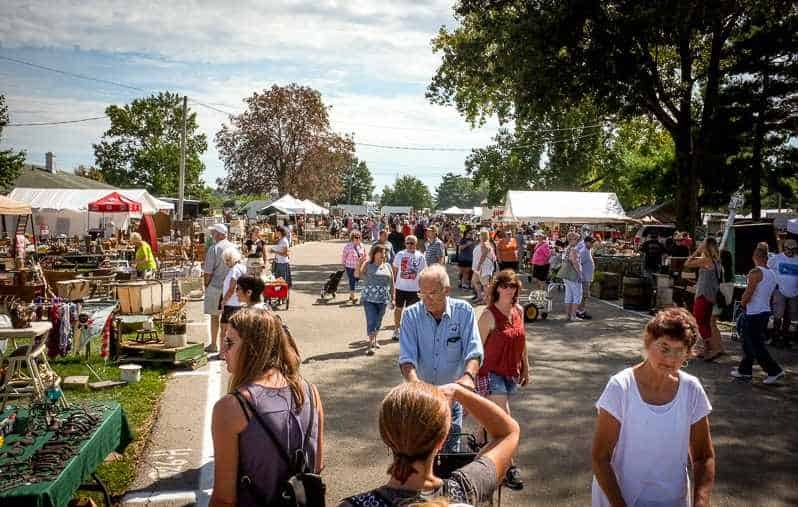 The Allegan Antique Market represents some of the best antique spots of the Midwest, and is arguably one of the 8 Best Flea Markets in Michigan. Held at the Allegan County Fairgrounds April through September, Allegan has over 400 dealers. The flea market dates back to 1978 and is a long-standing tradition among many antique seekers. China, jewelry, glass, kitchen items, clothing, furniture, sports items, and other vintage pieces are offered by the exhibitors. If you want to find something to furnish your home, head to Allegan to browse the various home decor pieces vendors often sell, including architectural salvage, industrial, primitive, mid-century modern, and more. 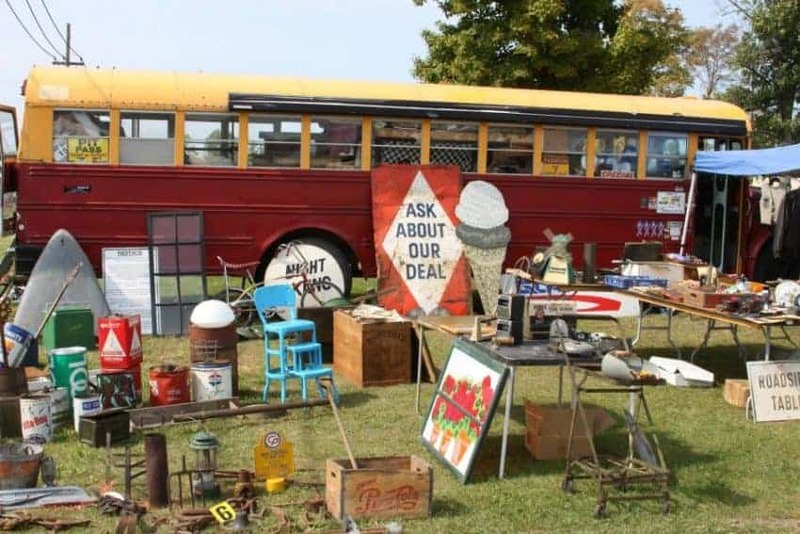 The Michigan Antique & Collectible Festival has been going strong for 50 years and regularly tops the list of the 8 Best Flea Markets in Michigan. Midland has between 800 and 1000 dealers spread across 80 acres of the Midland County Fairgrounds. The event is held three times a year with dates in June, July, and September. June’s show is one of the best spring flea markets in US because not only is the weather wonderful, the goods are plentiful. 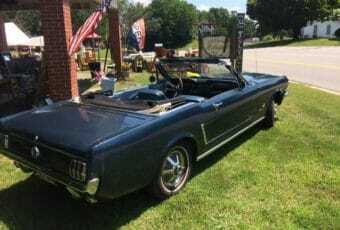 In addition to the vintage and antique dealers, there’s also a dedicated swap meet sand flea market area, giving you the chance to browse through thousands of items. Several special interest areas are present for shabby chic, industrial, coins, circus memorabilia, sports souvenirs, military items, and more. Sparks’ small size doesn’t matter during the 3-day long Sparks Kansas Antique and Collectables Flea Market, as thousands of visitors attend each spring and fall. When we say thousands, we mean it with over 70,000 people! A total of 500 booths are here with 450 of the stalls devoted solely to antiques. Sparks is the perfect location for the market as you’ll pass several other markets along the way, and show organizers coordinate their dates to run simultaneously. The event has been ongoing since 1982 and shows no signs of stopping either. No wonder why Sparks Kansas Antique and Collectable Flea Market is also one of the 10 Best Summer Flea Markets in the US. Vendors attending typically bring vintage toys, furniture, vintage clothing, antiques, China, silverware, jewelry, and all sorts of other great merchandise. 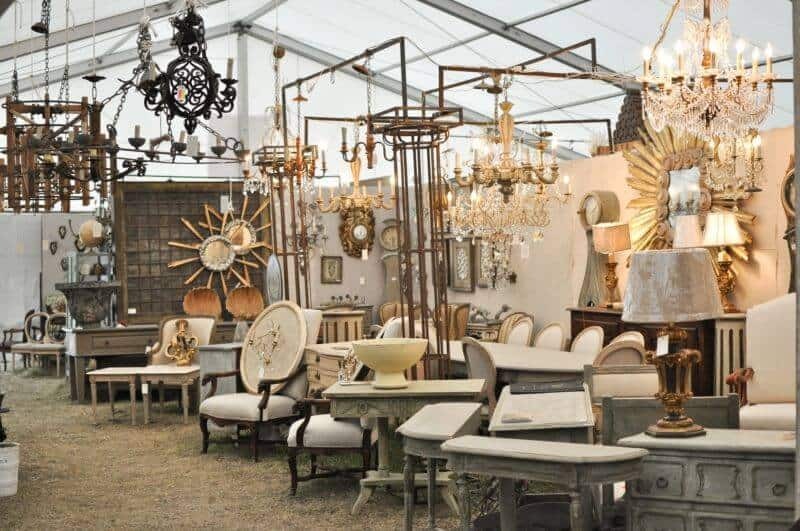 Another can’t-miss spring flea market in the US is the Washington County Antique Fair in Greenwich, New York. Twice a year on the first weekend in May and August in a scenic spot in the Hudson Valley, organizers present more than 200 vendors located indoors and outdoors. With antiques, vintage items, collectibles, primitives, and more up for sale, the participating sellers have brought their best merchandise. Comics, clothing, furniture, silverware, glass, art, and other items can be found at a reasonable price. Open rain or shine, the antique fair features free parking and includes actual bathrooms for guest comfort. Serious buyers know to purchase the Early Buyer pass to access the grounds on Friday. 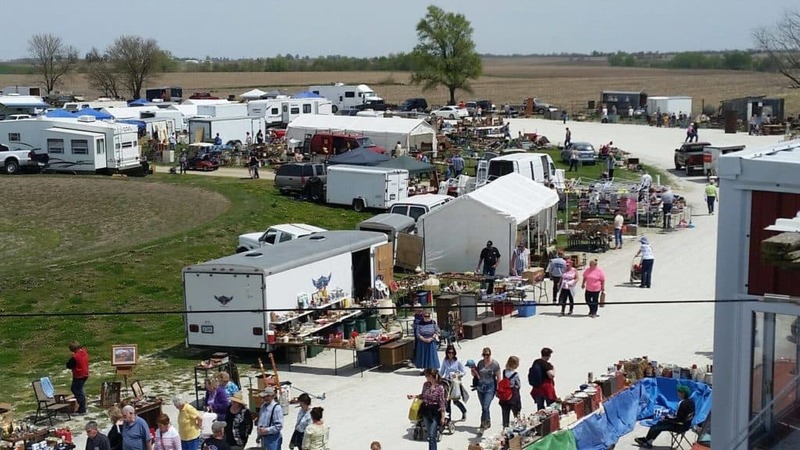 What Cheer Flea Market is one of the premier spring flea markets in the US, and the N°1 Flea Market in Iowa. It is held three times a year at the Keokuk County Fairgrounds. The flea market’s history dates back to 1976 with just a handful of vendors. Now there are more than 400 sellers from throughout the Midwest covering every inch of the grounds. One visit, and you’ll certainly cheer (no pun intended). Tables, tents, and stalls are crammed with goods including comics, toys, furniture, stamps, glass, retro items, farm machinery, sports collectibles, and any other type of antique or vintage item you could imagine. Admission is $5 for Early Birds on Thursday, and $2 on Friday and Saturday. Best of all? Sundays are free. Zurko Promotions’s longest-running is the Shawano Wisconsin Flea Market operating for 47 years. Located near Green Bay, the 150+ vendor show offers a variety of dealers, many of whom have been attending for over 10 years with plenty of merchandise to satisfy even the most picky collector. 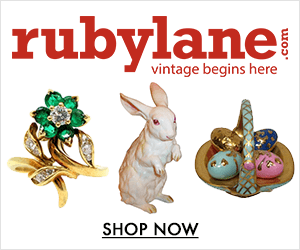 Items include primitives, coins, stamps, folk art, glass, country chic, antiques, and more. 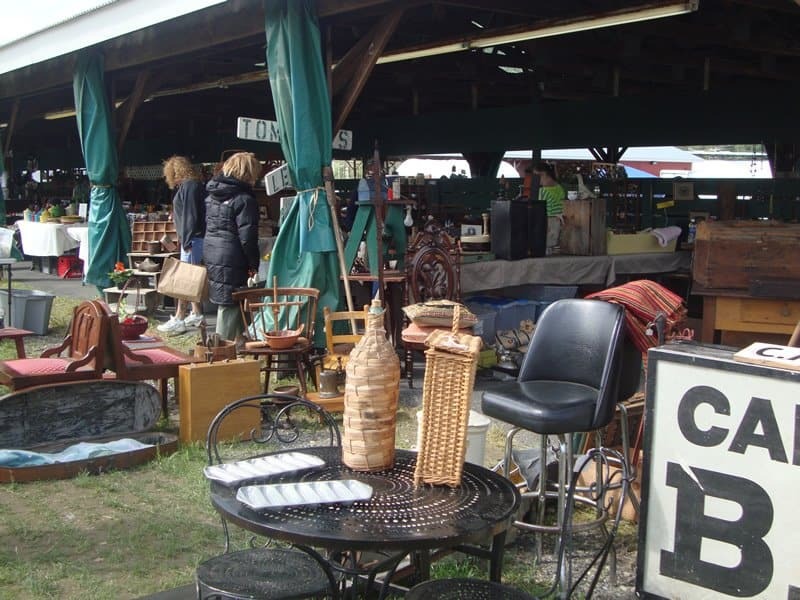 Shawano Wisconsin Flea Market is held each Sunday from March to October outdoors at the Shawano County Fairgrounds. A special two-day holiday event is held on Memorial Day Weekend. 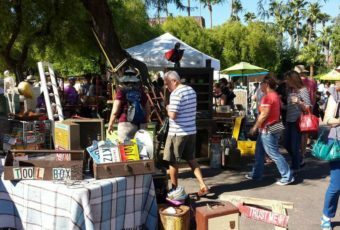 The park-like setting, ample shade, abundant food, and a family-friendly atmosphere have made it one of the best spring flea markets in the US. 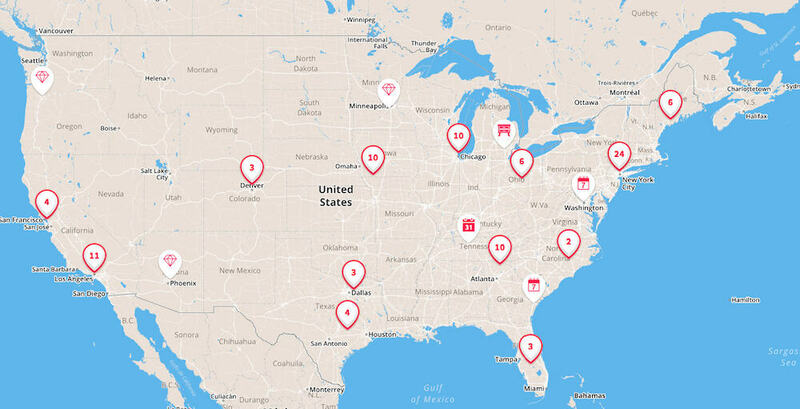 Bonus: 100 US Flea Markets on a Map! 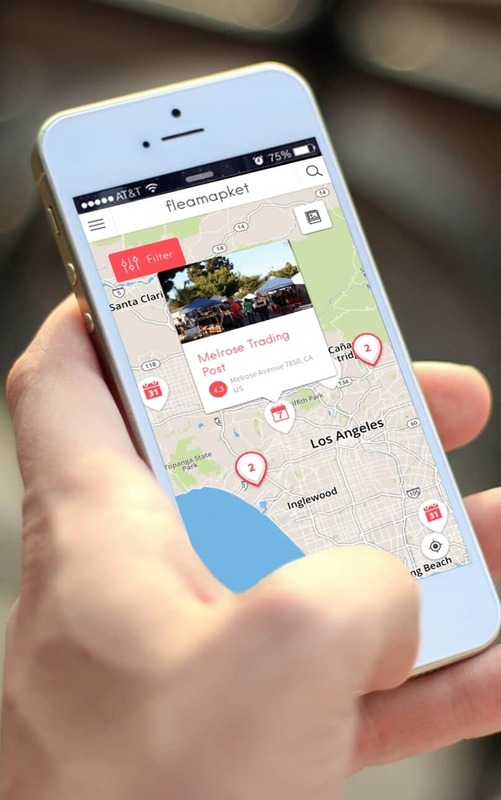 With our tool Fleamapket, you can view over 100 of the best flea markets in the USA on a map! 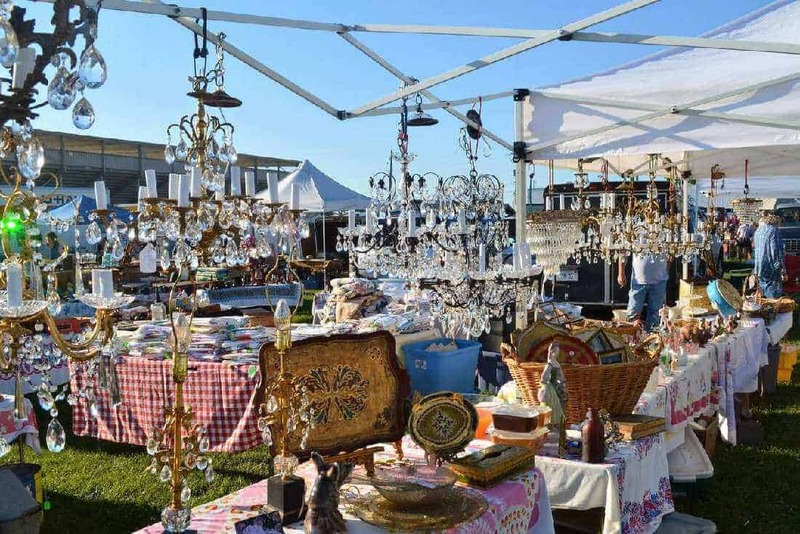 Not only did we include all the US flea markets that made it into our ranking of the 10 Spring Flea Markets in the US You Shouldn’t Miss, but we also added some of America’s most acclaimed antique fairs to the mix. Click on the image below to access our map feature for free. My friend is retiring from the Texas show at Carmine Dance Hall after 50 CONSECUTIVE shows! Nedra has had her booth, O’Briens, of Antique Linens and her hand cut Silhouettes framed in Daguerreotype frames since the 2nd show of the original Round Top antiques fair. She has the most outstanding collections, from her lifetime of collecting, you will see. Did I mention she is 77 years old? I wish you were there to stop in and see her! Thanks for keeping us updated on our beloved Fleas! Nancy, this is a lovely story! Thank you for sharing it with us. Your friend is really 77 years old? Well, one is never too young to deal with antiques :) And there’s nothing like really retiring from selling antiques: once a dealer, always a dealer!